All features of Open Automation Software including configuration tools and all .NET components support remote connections over your LAN, WAN, VPN, and the Internet. 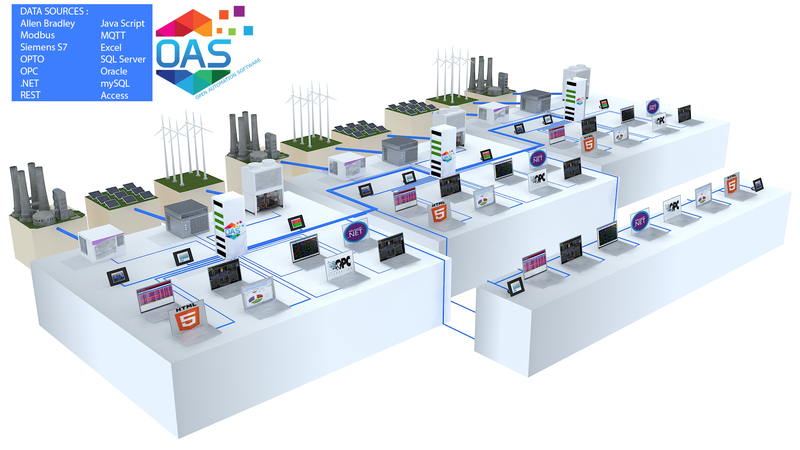 Visit the OAS IoT Network page for comparison of advantages over typical cloud networks which are push/pull communications. There are 4 networking features that can be used individually or combined together to support communications through corporate firewalls, access to systems without a fixed IP address, and through one way communication diodes. Visit each networking page for syntax examples on how to define client access to remote data services. Visit the Getting Started-Networking page for helpful features like network node aliasing in client applications and how to check if your TCP port is open. All communications for Open Automation Software uses WCF communications with an encrypted and compressed byte stream. The data that is transported from clients to services only transfers the data that each client has requested. Once all of the values are transferred only data points with new values are transmitted in the next packet. So if no new data occurs in the service the packet to the requesting client will contain 0 values. The default rate at which clients will try to obtain data from the service is 100 ms. This can be made faster or slower by setting the property Client Packet Rate under Configure-Options of the service. Every client that is communicating with the service will obtain this value when communications is first established. If a client cannot get a return back from the service within 5 seconds the connection will be considered lost. The Client Watchdog rate can be set for each client. Both the service and the client will know when the connection is lost and data. The actual amount of network traffic that is used is at the smallest possible packet size with WCF communications to be able to transfer the value, timestamp, and quality for each tag value to each client. If you have several remote clients need the same data from a remote service a second service can be setup with remote Tags as a data source to the first service, and all of the clients can communicate to the second service. This would be for all read only data to reduce the communications from a data source service from a remote location with low bandwidth. For any points that need to be written this can be done directly from each client to the remote service.